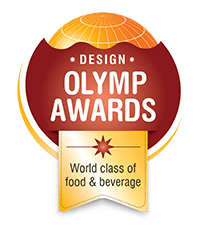 All branded (not bulk) processed or non-processed foods and beverages sold by retail stores are eligible for participation for the best packaging award (Design Olymp Award). The products to be evaluated must be in the appropriate condition for tasting and their distinctive information must be written out correctly and clearly on the label, i.e. they must be products ready to be sold to the consumer public. The judging team will consist of the Greek Graphic Designers Association, which is presided over by Mr. Tzanetos Petropouleas. The products are tested by a large panel consisting of 10 judges. The Design Olymp Awards can support the marketing strategy followed by every food and beverage company. They serve as confirmation when promoting the superiority of your products to candidate buyers. The well-known truth that customers shop with their eyes first with the price of the product following after, is another reason to participate in the contest, since the award logo on the product’s label will help boost your sales. The cost of participation is €280 + VAT= €347,2 including max 4 products (or 4 labels) for example: yogurt, olive oil, honey and pasta. If you are participating with more than 4 samples, the cost (after the 4th) is €60 + VAT for each participation.